Online UFO hunters claim to have caught NASA once again covering up evidence of alien UFO activity near the International Space Station by cutting off the live video after an alien UFO appeared on the feed. Prolific UFO hunter Streetcap1 reports sighting an orb UFO in a recent live stream from the ISS. The orb UFO, according to UFO Sightings Daily editor Scott Waring, appears to be shadowing the ISS in Earth’s orbit. However, Streetcap1 grants the possibility that the “object” could be a lens flare. He argues that the fact that NASA’s infamous “blue screen” interrupts streaming after the mysterious object appears in the live video indicates it is more likely a UFO that NASA does not us to see. Online UFO bloggers have reported in the past incidents in which NASA cuts to “blue screen” after a UFO appeared on its live ISS stream. According to UFO hunters, NASA’s habit of cutting live video when a suspicious object appears can be explained only by assuming the agency is trying to “hide something” from the public. Claims that NASA is trying to hide UFO evidence from the public is further encouraged by NASA’s steadfast refusal to respond to questions about why it habitually dumps its video feed as soon as UFO anomalies appear. UFOlogists allege that NASA only pretends it is committed to full alien and UFO disclosure. The agency reveals a hidden agenda by interrupting streaming when suspicious-looking objects appear in the live feed. Streetcap1 notes that the UFO in the latest ISS live video appears to be moving, keeping up with the ISS’s speed as it orbits the Earth. UFO Sightings Daily’s Scott Waring is certain that the anomaly in the video is an alien UFO shadowing the ISS in orbit. He argues that shadow and light reflection on the object indicate it is solid and not a lens flares. As noted earlier, this is not the first time that UFO bloggers have accused NASA of cutting live stream after a UFO appeared on the feed. The Inquisitr reported uproar in the UFO community in January 2015, when NASA allegedly interrupted live streaming from high-definition cameras mounted outside the International Space Station after a UFO — a mysterious grey object — appeared above the Earth’s horizon in space. 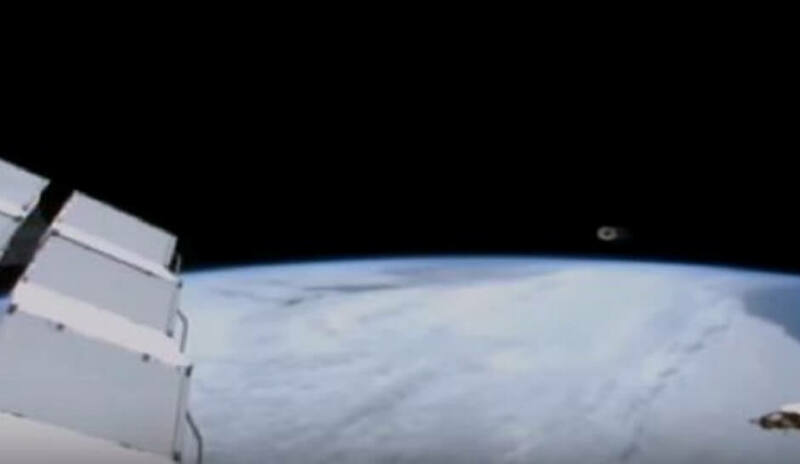 The video (see above) shows a UFO that comes into view in the distance and rises gradually to about the same level as the ISS in 275-mile orbit around Earth. But as the object approaches, the live video goes black abruptly and a message appears informing viewers that the high-definition camera is having technical difficulties. Skeptics have dismissed claims by UFO enthusiasts that the mystery objects in NASA’s ISS live video feeds are alien UFOs and proffered various alternative explanations, such as pixelation flaws in the high-definition images. Other skeptics have argued that mysterious grey or white objects that appear in ISS live video could be the Moon or some other bright natural object, such as a meteor or comet in the sky.